The Women’s Health Protection Act: Democrats finally stand up to the anti-abortion wrecking ball. Anti-choice activists have been gunning hard to outlaw abortion. Today, the Democrats pushed back. 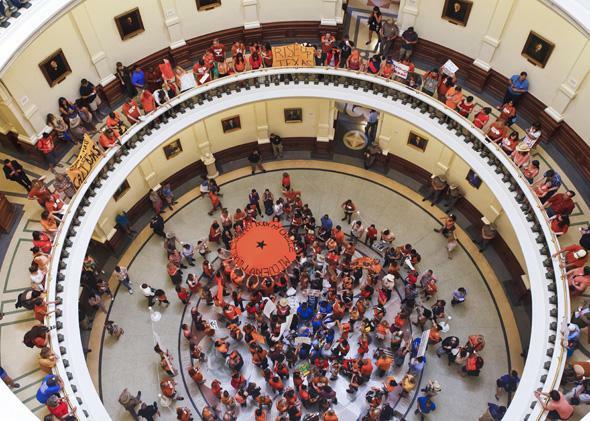 A rally to protest Texas’ restrictive abortion bill in July. Democrats in Congress have proposed legislation that would make such state laws more difficult to pass. For years now, proponents and foes of abortion rights have been playing something of a game of Supreme Court chicken, waiting to see which reproductive rights challenge will be the next to land at the Supreme Court, which hasn’t actually heard an abortion case since Gonzalez v. Carhart came down in 2007. On the one hand, abortion foes have been passing hundreds of laws that either explicitly or implicitly violate Roe v. Wade or Planned Parenthood v. Casey, in the hopes of challenging what remains of the court’s jurisprudence. But abortion rights activists have had to pick their battles carefully, attempting to challenge only those measures they were reasonably confident of defeating at the high court, or at least wouldn’t make significantly worse. And at the center of everything, like King Kong perched atop the Empire State building, the court itself has batted away challenge after challenge, content to leave Republican-controlled state legislatures to do all the heavy lifting, as one state after another has tried to make it all but impossible to legally terminate a pregnancy. The anti-choice strategy has been to close as many clinics as possible and to sideline as many providers as possible by crafting “abortion regulations” that force women to view ultrasounds, listen to inaccurate medical scripts, and find time to undergo multiple appointments; that force doctors to attempt to obtain ever-elusive hospital admitting privileges; and that force clinics to widen hallways and rejigger broom closets. And all of this has been done under the guise of a tender concern for women, their vulnerable bodies and unstable emotions, and the theory that just a few more regulations, warnings, and inches added to the clinic corridors will make them safer and more comfortable in the cruel world of abortion mills. As these regulations increase, clinics close and women in many states find themselves virtually unable to terminate a pregnancy. As a consequence, it’s not at all clear that the Supreme Court is going to be able to King Kong this issue away forever. Just on Tuesday, the high court batted back an appeal from Oklahoma lawmakers, seeking to reinstate a mandatory ultrasound bill that had been halted in the state courts. Only a week earlier the Supreme Court decided not to hear another Oklahoma case, this one trying to resurrect the state’s restrictive medication abortion ban. The court, or at least Justice Antonin Scalia, is expected to act in the coming days on an emergency request from pro-choice groups that a Texas law that would shutter one-third of the state’s abortion clinics be blocked. And most court watchers believe that the court is going to have to contend with the full Texas omnibus abortion law— the one that rocketed Wendy Davis to national public attention—sooner rather than later. Then there’s Arizona’s 20-week limit on legal abortion, which the court may also have to confront soon. And all of this is happening against the backdrop of Sen. Lindsey Graham’s (R-S.C.) new bill, titled the “Pain-Capable Unborn Child Protection Act,” that would ban all abortions after 20 weeks of pregnancy nationwide. After almost six years of being frozen into a sort of WWKD (what would Kennedy do?) rictus, the reproductive rights landscape seems to have shifted so quickly that it almost doesn’t matter what Justice Kennedy would do anymore; these cases are headed to Washington, D.C. and someone is going to have to decide something. All of this got even more dramatic Wednesday with the introduction of a bill called the Women’s Health Protection Act. Presented by Sens. Richard Blumenthal, Tammy Baldwin, and Reps. Judy Chu, Lois Frankel and Marcia Fudge, all Democrats, the bill is an effort to reaffirm Roe and Casey by pre-empting state efforts to enact measures like heartbeat bills, fetal pain legislation, and regulations that result in clinic closures, added expenses, and unnecessary delays. * It’s worth being perfectly clear that the bill will likely never pass the GOP-controlled House. But what’s important is that it represents Democrats—including male Democrats—taking a strong, long-overdue stand against state efforts to simply nullify Roe v. Wade with legislation that assumes Roe has already been overruled. The proposed legislation goes on to prohibit any laws that would regulate abortion providers in ways that are different from providers of “other medically comparable procedures” and also includes a prohibition on regulating abortion facilities in ways that differ from “facilities where medically comparable procedures are performed.” The bill attempts to provide clear legal guidelines to judges faced with determining whether an abortion regulation is impermissibly burdensome to women, including whether such regulations increase the time spent waiting for, or the cost of, an abortion, or meaningfully decrease access to abortion across the state. What’s most bracing about the proposed bill is that it represents a willingness on the part of Democrats in the House and Senate to stand forcefully behind Roe, and to challenge the entrenched thinking that only conservatives are willing to organize around reproductive rights issues. It’s the very opposite of the rear-guard action we’ve been seeing for so many years: an effort to give real legal force to the fact that Roe remains the law of the land, and to craft a legal response for those who are seeing abortion rights all-but-curtailed nonetheless. Finally, it signals that Wendy Davis and the women of Texas may be onto something: Standing up for a woman’s right to choose is neither shameful nor immoral, and standing by as those rights are rolled back is simply no longer an option.